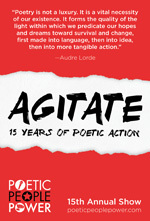 Poetic People Power celebrated its 15th anniversary with the show Agitate. This spoken word show took place at the Helen Mills Theater on October 14, 2017. Agitate celebrated the creative work, stories, and positive change that resulted from this poetic community. The show included work by poets Tara Bracco, Erica R. DeLaRosa, Philippe Garcesto, Karla Jackson-Brewer, Sugar Johnson, Shetal Shah, and Natalia Vargas-Caba. The show was funded by Left Tilt Fund and The Yip Harburg Foundation. 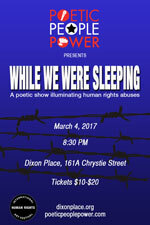 Commissioned by the International Human Rights Art Festival, we presented a poetic theater piece titled While We Were Sleeping at Dixon Place on March 4, 2017. This show uses poetic storytelling to illuminate human rights abuses around the world. Poets included Tara Bracco, Philippe Garcesto, Karla Jackson-Brewer, Shane Michael Manieri, Shetal Shah, Natalia Vargas-Caba, and Kesav Wable. This show was made possible by support from Left Tilt Fund, Louise Davis, and Wende Jager-Hyman. On October 26, 2016, we premiered our 14th annual show, Take Your Time, at Theater on Waverly. Poets presented new poems examining how our overworked culture and lack of leisure time affects our health, relationships, and communities. Inspired by the Take Back Your Time movement, this spoken word show explored the psychology, cultural differences, and consequences of time poverty. Poets included Bogar Alonso, Tara Bracco, Philippe Garcesto, Karla Jackson-Brewer, Angela Kariotis, Shane Michael Manieri, Scottt Raven, and Shetal Shah. Funding made possible by the Puffin Foundation. 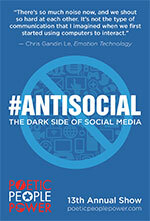 We premiered our 13th annual show, #AntiSocial: The Dark Side of Social Media, at Wild Project on July 8 & 9, 2015. Poets presented new works about how social media has become increasingly toxic in recent years, and how it's affecting our behavior, relationships and society. Poets included Bogar Alonso, Tara Bracco, Karla Jackson-Brewer, Angela Kariotis, Shetal Shah, Natalia Vargas-Caba, and Jonathan Walton. The show was made possible through the generous support of Left Tilt Fund. 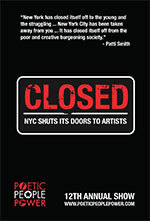 On July 23, 2014, we presented our 12th annual show, Closed: NYC Shuts Its Doors To Artists, at Theatre 80 on St. Marks Place. Poets premiered new works about how New York City is no longer a haven for artists. Poets included Tara Bracco, Andy Emeritz, Vaimoana Niumeitolu, Scottt Raven, Shetal Shah, Pamela Sneed, and Justin Woo. The show was funded with a leadership gift by Robin Stern and with support from several individuals in our community who generously donated to make this show happen this year. 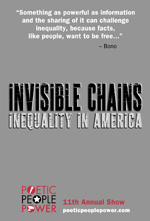 We premiered our 11th annual show, Invisible Chains: Inequality in America, at the Wild Project on July 31, 2013. Poets showcased new poems about race, gender, and class inequality. Poets included Tara Bracco, Nicole Goodwin, Karla Jackson-Brewer, Frank López, Scottt Raven, Shetal Shah, and Justin Woo. The show was funded by Lower Manhattan Cultural Council. 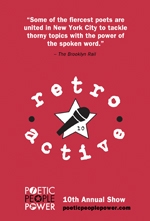 Poetic People Power celebrated its 10th year with the show Retro-Active. This retrospective took place at the Helen Mills Theater in midtown Manhattan on May 17, 2012. The show, which included poems by 15 artists, took a look back at Poetic People Power's artistic response to the changing political landscape over the last decade and presented new poems on the progress of political issues covered in past shows. It was truly an inspiring evening! Poets featured included Bogar Alonso, Tara Bracco, Karla Jackson Brewer, Erica R. DeLaRosa, Andy Emeritz, Nate Gunsch, Angela Kariotis, Dot Portella, Shetal Shah, Pamela Sneed, Jonathan Walton, Justin Woo, and Deanna Zandt. This show was funded by the Left Tilt Fund and the Puffin Foundation. 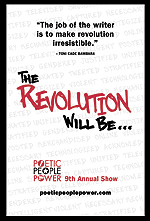 On May 25, 2011, Poetic People Power's 9th annual show, titled The Revolution Will Be..., premiered new poems about protest and revolution. Poets featured were Tara Bracco, Erica R. DeLaRosa, Andy Emeritz, Frantz Jerome, Jonathan Walton, Justin Woo, and Deanna Zandt. This show was funded by the Lower Manhattan Cultural Council. 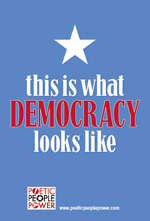 We premiered our 8th annual show, Price Check: How We Became A Culture of Consumption, on May 19, 2010, at the Grand Theater at The Producers Club. 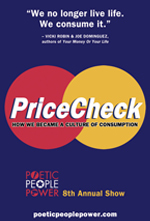 This spoken word show explored the economics, psychology, and costs of our consumer culture. Poets featured were Tara Bracco, Erica R. DeLaRosa, Andy Emeritz, Nate Gunsch, Frantz Jerome, Angela Kariotis, Shetal Shah, and Justin Woo. This show was funded by Becky Katzman, Joe Gonzalez, Roseanne & Denis Bracco, the Puffin Foundation, and the Lower Manhattan Cultural Council. 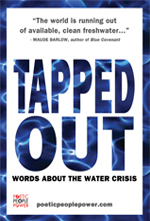 On April 25, 2009, we presented Tapped Out: Words About The Water Crisis at Bowery Poetry Club. This show premiered new works about the privatization of water, the dangers facing freshwater, and the growing scarcity of this precious resource. Poets featured were Tara Bracco, Erica R. DeLaRosa, Andy Emeritz, Frantz Jerome, Angela Kariotis, Dot Portella, and Jonathan Walton. Tapped Out marked our seventh annual show. For our sixth annual event, Activism: The American Way, poets advocated for ongoing citizen engagement and the reclaiming of patriotism. The show was presented at the Bowery Poetry Club on April 25, 2008. Poets included Tara Bracco, Erica R. DeLaRosa, Frantz Jerome, Sugar Johnson, Angela Kariotis, Chris Martin, Shetal Shah, and Jonathan Walton. This show was funded by Becky Katzman, the Puffin Foundation, and the Lower Manhattan Cultural Council. This show marked our fifth annual event. 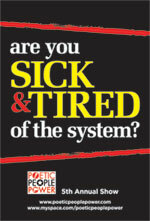 Sick & Tired advocated for universal health care and was presented at the Bowery Poetry Club on April 11, 2007. 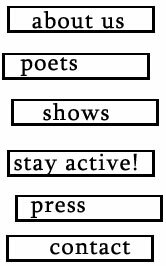 Poets featured were Tara Bracco, Cynthia Bruckman, Erica R. DeLaRosa, Frantz Jerome, Sugar Johnson, Chris Martin, Pamela Sneed, and Jonathan Walton. The show was funded through the generous support of the Puffin Foundation and the Lower Manhattan Cultural Council. 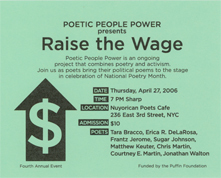 On April 27, 2006 we presented a show called Raise the Wage at the Nuyorican Poets Café in New York City. 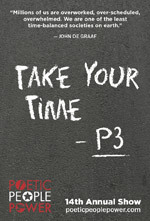 Poems focused on wage issues such as pay equity, class gaps, and advocacy to raise the federal minimum wage. Poets included Tara Bracco, Erica R. DeLaRosa, Frantz Jerome, Sugar Johnson, Matthew Keuter, Chris Martin, Courtney E. Martin, and Jonathan Walton. This show was made possible with funds from the Puffin Foundation. 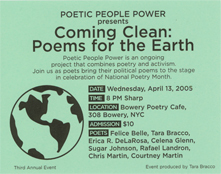 Coming Clean was presented on April 13, 2005 at the Bowery Poetry Club in New York City. This third annual Poetic People Power event gathered eight diverse poets reading and performing new poems about environmental issues to coincide with Earth Day. Poets included Felice Belle, Tara Bracco, Erica R. DeLaRosa, Sugar Johnson, Rafael Landron, Chris Martin, and Courtney E. Martin. Poetic People Power and Ars Nova Theater presented Voices on Voting and Democracy on April 14, 2004. In this election year, poets were asked to write new poems on this timely topic. Poets included Tara Bracco, Andy Emeritz, Galinsky, Chris Martin, Courtney E. Martin, Dot Portella, and Shetal Shah. 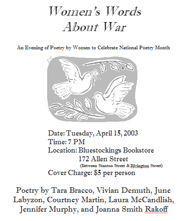 On Tuesday, April 15, 2003, we celebrated National Poetry Month with a reading called Women's Words About War. The reading was inspired by the Poets Against the War movement. Poets included Tara Bracco, Courtney E. Martin, Laura McCandlish, June Labyzon, Jennifer Murphy, and Joanna Smith Rakoff. 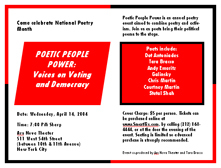 This pilot event was a surprising success and launched Poetic People Power's annual shows.